What’s wrong with my tomato plant? This has some excerpts from an earlier post in 2015 in June and new info as well in 2016. We are experiencing heavy pressure from the Beet Leafhopper which transmit a virus called Curly Top Virus (CTV) to tomato plants now in 2016. Please read below. Last year, the Beet Leafhopper which transmits ‘Curly Top Tomato Virus’ was rampant in our gardens and devastated many of our tomato plants. I lost only 1 plants out of 125 in 2015 to it but only because I take extraordinary measures to protect them. Here is some information on the beet leafhopper, how to identify it, symptoms and how to protect your plants. 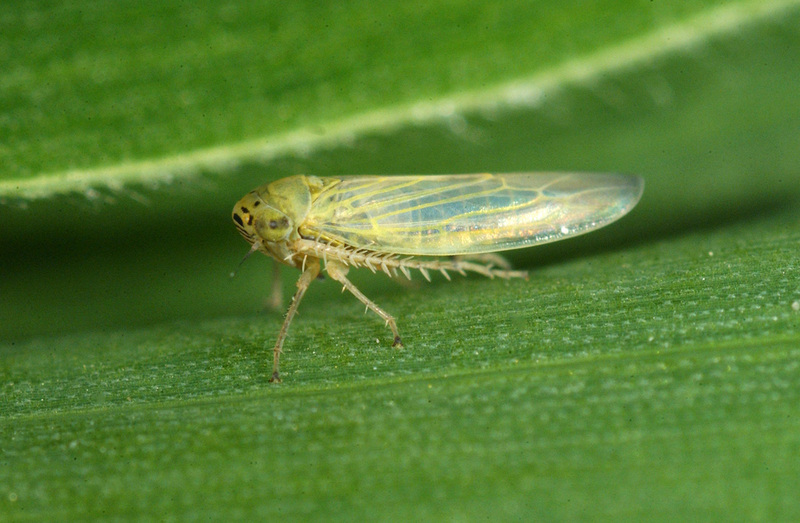 The Beet Leafhopper flies in on the winds in early June through early July, jump on the tomato plants and taste them. It is a big problem in the Southwest and inland in California where it is hot. They don’t even like to eat tomato plants but sample them, transmitting the disease in the process, then fly off to visit other plants. The beet leafhopper is very small-about 1/8 inch long, pale green to light brownish green and has wings that look like a tent when folded up vs spread out like a moth. See photo on left. They come when conditions are dry, hot and windy. Sound familiar? This is typical June-early July weather here in the greater Santa Fe area. You will know if they are in your garden as they come in and when you walk around your garden, you’ll see jumping little green bugs that fly off when you walk by. Then they leave—flying to the next garden. Because of this, you can’t really spray anything to get them because they hop so fast and only stay in the garden a short time—here today, gone tomorrow. 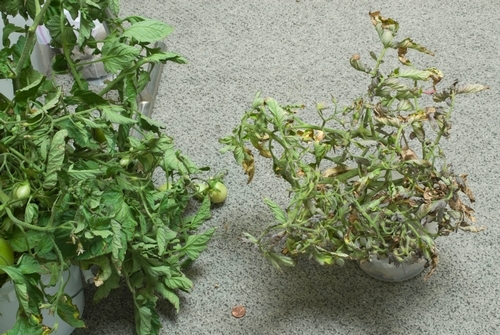 By the time you notice something is wrong with your tomato plant, they are long gone. It takes about 2 weeks for symptoms to show up. 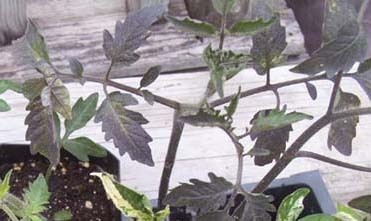 Your tomato plant leaves will start to curl and the underside of the leaves and veins will turn a purplish color. 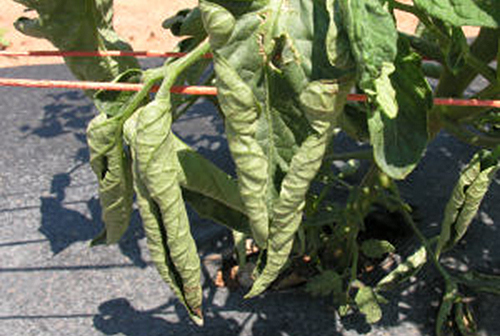 The leaves then start to wilt and the plant will look stunted. You might think it needs water but it doesn’t, it is sick and won’t recover. 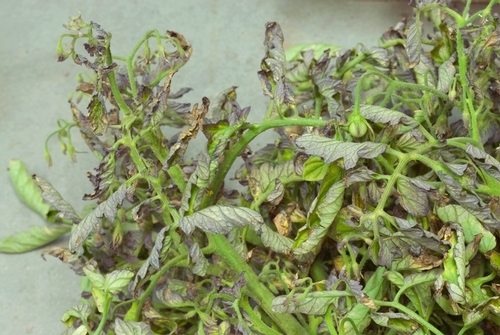 There is no cure for tomato plants with this disease. ‘Curly-Top Virus’ is only transmitted from bug to plant and is NOT transmitted from plant to plant hence you will see a healthy plant next to a sick plant. The pictures above show 2 plants with curly top. The first one is beginning to be sick with curly leaves and the veins will turn purple. The second plant in the picture is advanced. • The main thing I do is create a physical barrier between the bugs and the plants. I now cover all tomato plants with row cover until the bugs leave. 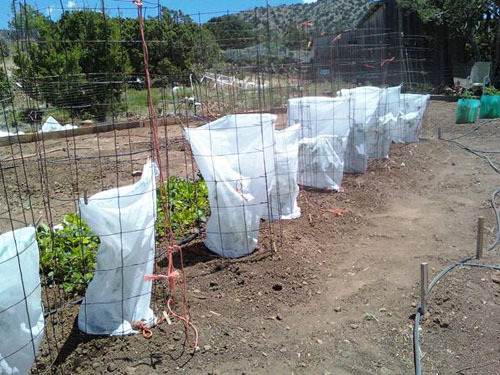 Wrap the row cover around your tomato cage and put a piece on top of the cage BEFORE they come. I observe they either leave or are suppressed after the monsoons come in July when it is cooler and wetter. After the monsoons roll in, I take off the row covers BUT NOT UNTIL THEN. I hope they come in soon as they are late right now. 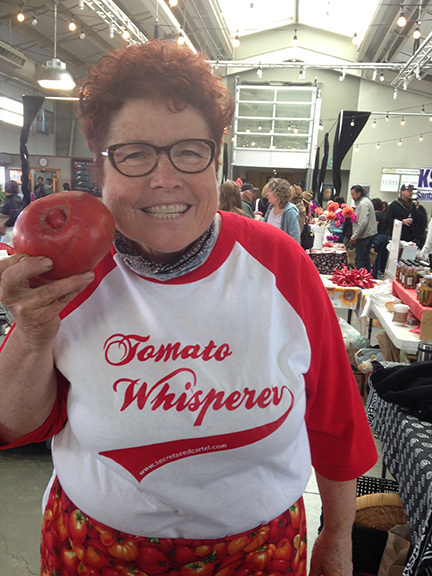 Tomatoes are self pollinating so they aren’t pollinated by bees or other pollinators. Another thing I’ve noticed is many of my purple or black tomato varieties seem to get hit hard. I wonder if they give off something that attracts the leafhopper? Right now all of my tomatoes are covered. 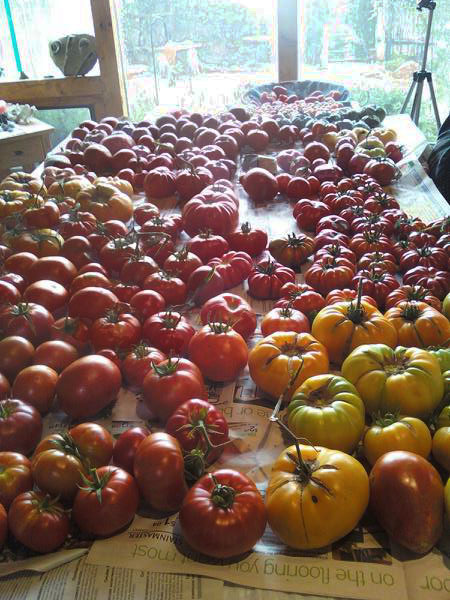 • Lastly you could put out some tomatoes later in the season after the bugs leave but you’ll have to put in early season varieties so you can still harvest before the season ends. I buy gallon size at that point so as not to be too far behind. Agua Fria Nursery still has 1 gallon tomatoes as of now. A couple of years ago when I was out at the Santa Fe Community Garden, I noticed many rows of sick tomato plants but one row of perfectly healthy plants and when I asked about them, it turned out they were put out about a month later than the rest of them and by then the leafhoppers were gone. Dry, sunny, windy weather are perfect conditions for the leafhoppers so look out this summer-conditions are ripe again until the monsoons come! IMPORTANT NOTE:Now there are three cases where you may think you have curly top virus but may or may not have it. The second condition is early in the season, not now. Sometimes the leaves turn purple when it is still cold outside. This is a phosphorus deficiency. This never happens in June or later when it is warm but more in May if you plant early and it is still cold outside.